First impressions of Ban are generally that he is a rude person and has a great sense of pride. With his unruly hair (He's often called "Urchin Head") and sunglasses, people already judge him poorly (It doesn't help that he gives unflattering nicknames to almost anyone he meets, e.g. "monkey trainer" Shido and "thread spool" Kazuki). But he is actually a great guy with a strong sense of leadership and a very talented person. He is one quarter German and he's the grandchild of the "Last Witch of the 20th Century". 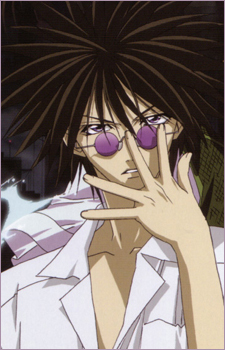 He's also a brother-like figure to Himiko Kudo after she has gotten over her brother's death. Himiko's average fighting skills meant that she often bites off more than what she can chew. In such situations, Ban can be counted on to come to her aid (though it must be noted that she does return the favor at times). In the GB duo, he's often the one who thinks of plans for their moves. Initially, Ginji was seen to be a sidekick to him. (In fact, when they first formed their partnership, Ban insisted that Ginji was only his sidekick.) As the story progresses, Ginji gradually held his own in their missions, and Ban acknowledged him as an equal.